While a platoon or company of infantry is a dangerous force to fight, it doesn't always carry the best weapon systems available at all times. Units are task-organized to fit their purpose - if the area of operations does not have enemy armor, why carry heavy anti-tank assets? If no aircraft are known to be operating in the area, nor likely to show up even in the most extreme circumstances, why bring anti-air missiles? Whenever special weapons are needed to fulfill the mission, they come from higher organizational units and are attached to the company or platoon for specific missions. These heavier and more specialized weapons are significant force multipliers, and in this section we will go over the most common attachments you can expect to see, as well as how to best employ them and their particular skill sets. 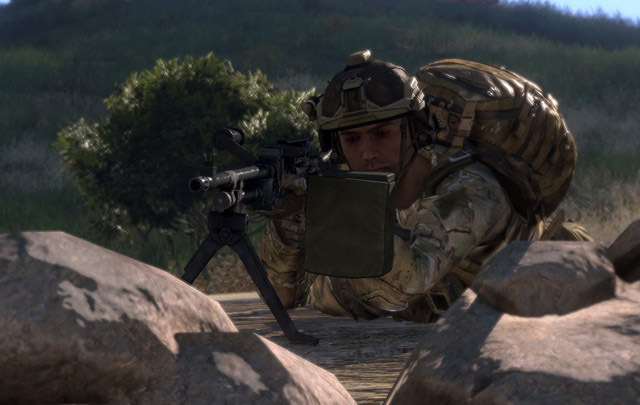 In addition to these special attachments, we'll also cover some of the units you may find at the squad or platoon level that are outside of the normal squad structures - such as designated marksmen. A Designated Marksman is a squad-level unit that is equipped with a special rifle fitted with some sort of magnified optic. Their task is to provide accurate fire and observation on the enemy from ranges beyond what the normal riflemen can achieve. They are the precision shooting asset of a squad. The important distinction between a Designated Marksman and a true sniper is that the DM is attached to a squad and operates with it, to support the squad, whereas a sniper team operates independently and is a platoon-level asset (or higher), under the direct command of the Platoon Commander. The DM typically engages at medium to long ranges (ie - 300-700m), whereas the sniper team can operate out to ranges in excess of one kilometer. Act as overwatch whenever possible. Your optics will give you a better view than the rest of your teammates - take advantage of it. Support the squad by fire from the best position you can find. 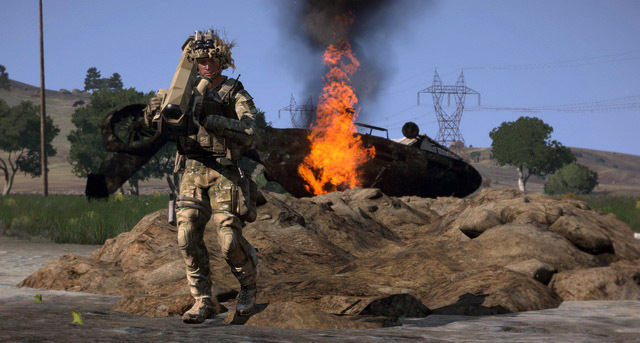 When your squad is in combat, it is your job to target high-priority enemy combatants (ie machinegunners, team leaders, anti-tank gunners) and eliminate them as quickly as possible. Once they're down, attack enemies based on the threat they pose. Pay particular attention to longer-ranged targets that the regular infantry may have difficulty engaging successfully. Stay far enough back in any formation that you are able to maneuver at will if the element comes under fire. Being able to pick the best possible firing position is a much better option than being forced to take the first one you can find nearby. The role of a Scout/Sniper team is to both provide battlefield recon and intelligence and deliver precision shots on key enemy personnel. A Scout/Sniper team can be highly effective without ever firing a shot in some situations, whereas other scenarios will see them having a dramatic effect due to their ability to 'lock down' an area with precision shooting. 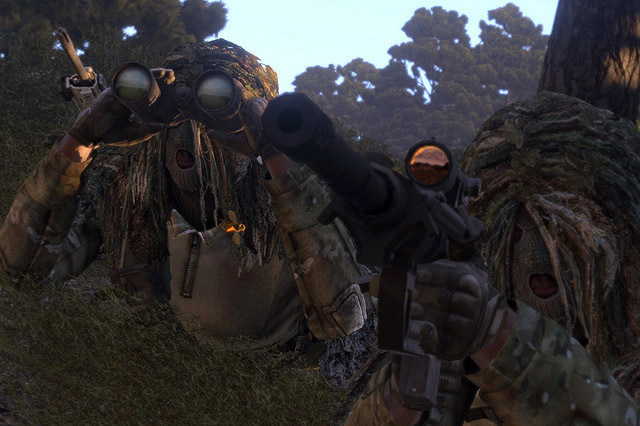 Each Scout/Sniper team consists of two people - a sniper and his spotter. 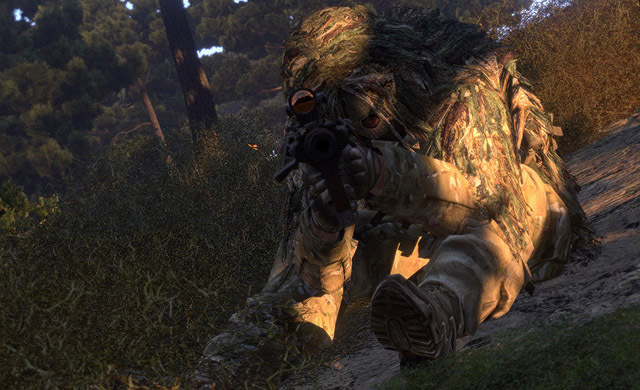 They are typically outfitted in ghillie suits to assist in concealment, and tend to operate at a significant distance from any friendly forces. Their mission is primarily scouting/reconnaissance, though their marksmanship will often be called into play when things heat up. 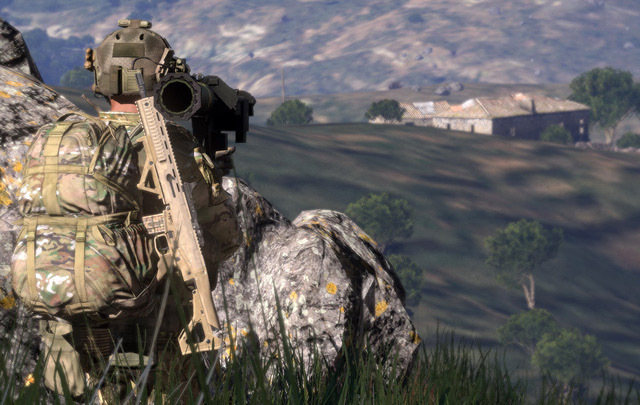 When operating in denser terrain such as urban operations or in theaters where the enemy presence is significant, sniper teams can be augmented with additional members. A common technique is to use two sniper teams, with two or more additional infantry coming along as a security element. 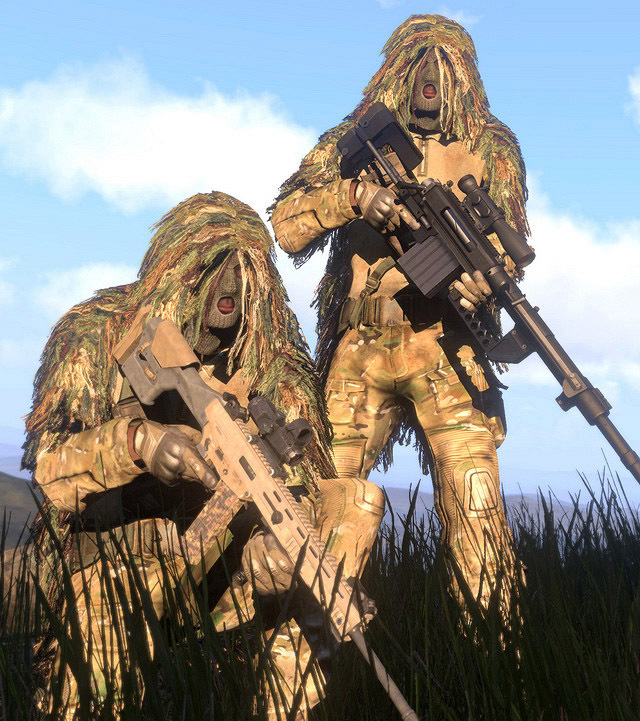 Regardless of the overall size of the team, the basic responsibilities of a sniper and spotter pair are as follows. Junior member of the team. Carries and employs the sniper rifle. Engages long-range or precision high-value targets and key enemy personnel. Listens to his spotter's directions. Provides intelligence and reconnaissance to the platoon. Picks the specific 'hide'/shooting position(s) that will be used. Plans the route that the sniper team will use to get to their 'hide' position. Plans the exfiltration route from the 'hide' position. Equipped with a rifle with grenade launcher as well as binoculars. Provides security for the sniper. Assists the sniper in locating, identifying, prioritizing, and ranging targets, as well as spotting the effects of the sniper's shots. Frequently acts as the point man when moving to or from a position. One Shot, One Kill. 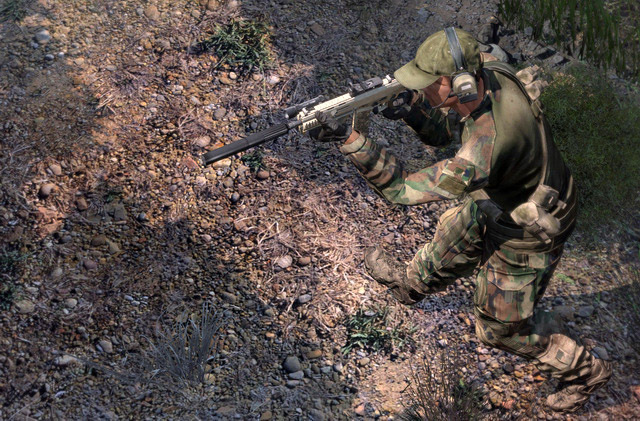 In an ideal environment, the sniper strives to fire only one shot from any position that he occupies. A single surprise shot is extremely difficult for the enemy to trace back to the sniper's position, and the morale impact that a surgical elimination of someone has is quite dramatic. If the enemy believes that they will be picked off if they poke their heads up or otherwise leave cover, you will have accomplished the suppression of an entire element with a single well-placed bullet. Get on the enemy's flank. The prime place for a sniper to be is off to the side of the enemy. If the enemy is expecting to make contact to their front, they will almost always orient themselves so that they're in cover to their front yet are open on their flanks. Not only does this provide a nice, juicy target to you, but it has the added benefit of being very confusing for them, and typically has them looking in a direction that you are not in - namely, to the front - which naturally means that they are not likely to see any firing signatures from your position (ie muzzle flash, smoke). If you are observing an enemy element from their flank, and friendly forces engage them from the front, you will very likely find yourself faced with a great many prime targets in short order. Be patient. Move slowly and deliberately into position. You'll be surprised at how safe you will be if you only use a bit of common sense in how you move. Stay low and slow and avoid sudden movements, as they draw the eye. Patience also comes in handy when it comes to shooting - waiting for a perfect shot on a valuable enemy person, like a machinegunner, squad leader, or similar, will pay off in spades in the long term. Wasting your initial shot on some poor FNG isn't going to have nearly the same effect as putting a bullet through the squad leader's head. Target the important people first. 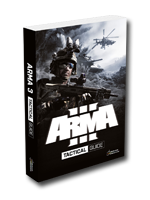 You want to shoot at leaders, enemy snipers/designated marksmen, machinegunners, radiomen, and other high-value targets. One decent way to tell if they're a leader is whether or not they have binoculars - if they do, they're likely someone of some importance. Another way is to observe who a formation is guiding off of. Less-coordinated groups will typically form a "tactical trailing blob" around their leader. Relocate frequently. Depending on the tempo of the battle, a sniper may or may not be able to relocate between shots. When possible, snipers should move to a new shooting position any time that they can, or any time that they believe their current position has been pinpointed within a reasonable degree of accuracy. One tactic that can be used is to fire from a position, make yourself known, and then relocate to an adjacent position from which you can put fire on your previous location. In this manner you can engage any enemy infantry elements that might have been sent to flank you. As a general rule, always assume that the enemy will locate you significantly before you would think they would locate you. Playing it safe will pay off in survival. Shoot from back to front. If you're on the flanks of the enemy (as you should be), engaging targets that are to the rear of the formation will cause it to take longer for the enemy to figure out that they're taking effective sniper fire. The last person in the formation can topple over from a shot to the head without anyone seeing him, after all, which gives you time to work your way from back-to-front until you've inflicted a number of casualties before they've noticed. Shooting from back-to-front can also make the front people think that someone is firing ineffectively and missing them, causing them to be more bold in their movements. Take advantage of loud noises to mask the sound of your shots. 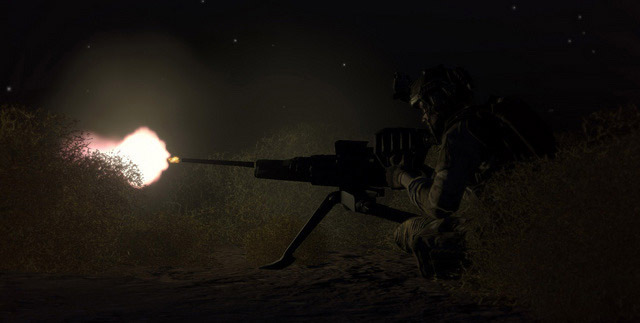 Firing when the enemy is firing, or when explosions or other loud noises are happening, can make it harder for the enemy to notice the sound of your rifle (particularly if it makes a distinctive noise). Consider what it looks like from the enemy's perspective, and try to shoot at deceptive times. For instance, if a player is advancing in cover, and then peeks his head around a corner and is shot, the natural assumption to anyone near him is that there was an enemy around the corner. If the reality is that a sniper shot him from the flank or rear, it is very unlikely that the enemy will figure it out before it is too late. 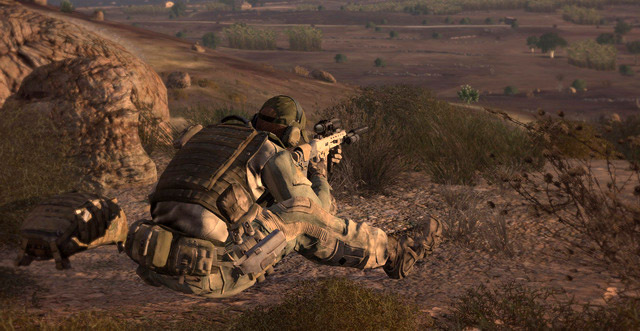 The 'sitting' stance can be used to maintain a high level of stability when grass or obstacles prevent target acquisition in the prone. Narrow lanes of fire can minimize the angles that you can be spotted from. If you position yourself back from two large bushes and fire through a small gap between them, at a distant slice of ground, you will be far less likely of being spotted. The reverse side is that it will limit the area you can observe and engage targets in. Balancing out just how much of a field of view you need versus how much cover or concealment you need is an art that will take time to perfect. When firing up or down at a significant incline towards an enemy target, one must be aware of the fact that their bullets will generally strike higher due to weapon ballistics. In situations like this, a player needs to use the horizontal - or "map range" - of a target to calculate drop, and not the actual straight distance to the target. This is a rough rule of thumb that works acceptably to most shooting distances that Arma3 portrays. 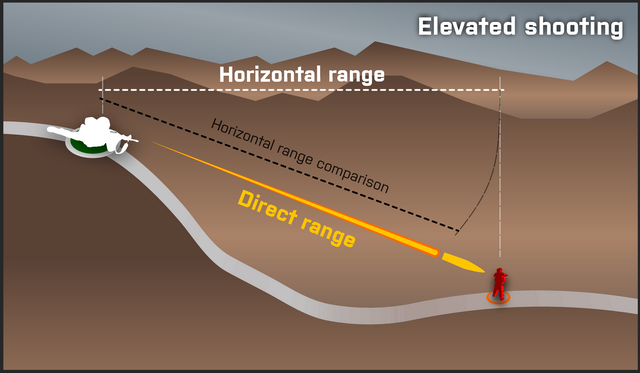 As you see in the below illustration, the direct range to a target when on an incline is further than the horizontal range. If you use the direct range to calculate your hold-over, you will inevitably end up firing over them. When in doubt, if shooting on an incline, aim lower than you normally would at the target. Special Forces soldiers are defined by their high level of training and proficiency, above-average gear, and the fact that they typically get the toughest of assignments requiring the greatest judgment and decision-making skills - not to mention combat capabilities. 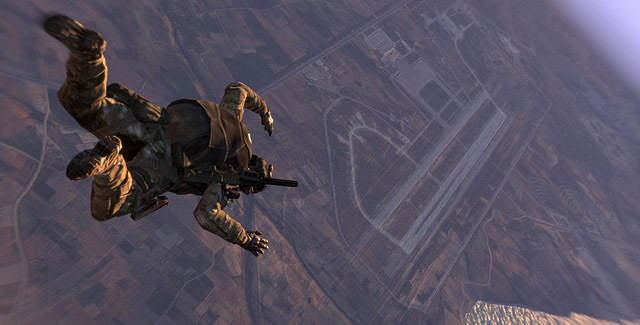 A special forces team member in the midst of executing a High Altitude, Low Opening (HALO) parachute jump. Special Forces troops are considered to be advanced roles due to them requiring more finesse and skill to play compared to normal infantry, largely because of the fact that they get tough assignments and rarely work in anything larger than a squad-sized element. 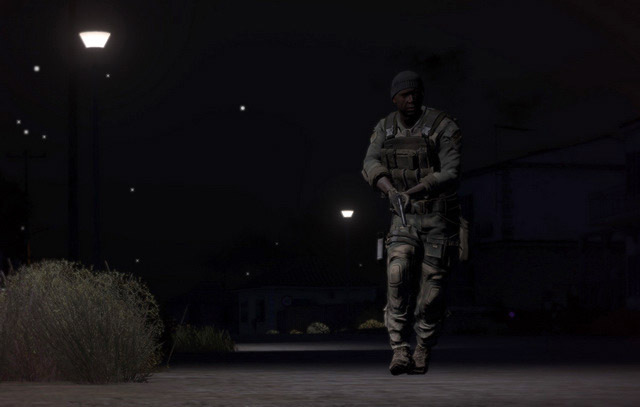 Special Forces units require patience and levelheadedness to play, particularly when stealth is an element of the mission, as it often is. Unfortunately, it is all too common to see players in take SF roles without a clear comprehension of their intended usage, usually because they're seen as "cool roles" and whatnot. This tends to result in a lot of dead "SF". Special Forces soldiers are often the ones behind enemy lines calling in close air support or acting as forward observers for artillery. To this end, they often carry a laser designator which can be used to guide in laser-guided bombs. Special Forces are expected to be familiar with how to act as a Forward Air Controller (FAC) and a Forward Observer (FO) - both topics are covered in the "Combined Arms" section of this guide - as well as skilled in reconnaissance tasks. Small unit leadership and individual judgment and initiative are key. Special Forces teams are trusted to make tough decisions when everything is on the line. A team with weak leadership and poor initiative is no better than a sub-par infantry team, and a "sub-par infantry team" doesn't cut it for typical SF assignments. The mission comes first. Killing a lot of the enemy is meaningless if your primary objective is not accomplished. Being a SF unit often means that you have to spend more time evading and sneaking by the enemy than you do actually directly fighting them. If all you want are firefights and kill counts, Special Forces units are not for you. Stealth is essential. A small element like an SF team cannot get engaged with a large enemy force if it intends to make it out in one piece. SF teams must be able to pick their fights and evade the enemy when necessary. Be prepared to break contact if engaged. SF teams can use their demolitions on time-delayed fuses to hold up any pursuing elements of the enemy if need be. When breaking contact, an SF team will alter their direction of movement once out of sight of the enemy so that they cannot easily predict where the team is headed. Be familiar with close air support and forward observer techniques and procedures. An SF team that cannot call in artillery or air strikes is like a rifleman who doesn't know how to aim his weapon or pull the trigger. Call in the heavy weapons whenever you can. CAS and artillery are the major force multipliers for SF troops. Nobody gets paid extra because an aircraft went back to base with leftover bombs, or if the artillery unit had some ammo left over at the end of the day. Make them work for their pay. In addition to being very quiet, suppressed weapons do not have visible muzzle flashes. This makes it much harder for the enemy to locate operators equipped with such weapons in the dark. Silenced weapons (as opposed to suppressed) fire subsonic ammo and thus have neither a muzzle flash or a supersonic bullet signature. The down side to this is that silenced weapons are extremely weak compared to other weapons. Burst or full-auto is the way to go with these, and close-range is a necessity. Due to their special nature, crew served weapon teams do not generally fit into the typical platoon organizational structure. Instead, these teams are organized into what is known as a Weapons Squad, complete with a Weapons Squad Leader (WSL) who is the main point of contact for the teams. The Weapons Squad is almost always split up during a mission to best facilitate the mission commander's plan. Elements - be they machineguns, anti-tank, or otherwise - are pieced out and attached to squads that they will support during the mission. The Weapons Squad maintains a communication channel of their own for overall communication amongst the teams, while the individual teams tend to move onto the same radio net as the squad they're supporting in order to best communicate with them. The Weapons Squad Leader shares some traits in common with a typical squad leader, but drastically differs in many ways due to the nature of how his different squad elements will be pieced out throughout a platoon or company action. Have a solid understanding of how to employ the teams they're leading. A Weapons Squad Leader must be able to give advice on how his teams would best be used, acting as the subject matter expert for the mission commander. This includes both offensive and defensive actions - in the defense, the WSL should be able to identify, with the help of his weapons elements, the best locations for placing his assets. In the offense, the WSL should be able to identify where his elements would be most beneficial to the mission commander's stated intent. Supervises his teams as they employ their weapons. Due to the fragmented nature of his squad's employment, the Weapon SL will generally not be able to personally observe his teams at the same time. Instead, the WSL picks the most significant team to stick with, using his radio and map to stay aware of the other teams. He provides guidance both to his teams as well as the mission commander in order to best employ the specialized weapons his teams carry. Coordinate the higher-level movement of the teams, such as during convoy or aerial operations. He ensures that his elements are spread across various transport vehicles, such that the loss of a single transport does not take the entire Weapons Squad with it. Dispatches the Weapons Squad Medic to teams that are unable to receive medical support from the elements they're attached to. In the event that Weapons Squad elements are operating independently, the WSL may assign the medic to tag along with the most valuable team. The Weapons Medic will ensure that any other elements have sufficient medical aid as to provide self-aid in the absence of the medic. Maintain awareness of the ammo states of the different teams and communicate this to the mission commander in order to facilitate resupply efforts. Crew-Served Weapons (CSWs) are heavy machineguns, mortars, grenade machineguns, anti-tank missile systems, and other weapons which require more than one person to carry around, deploy, and operate due to their bulk and weight. These are another form of attachment that can be added to a platoon to give it increased capabilities. Some crew-served weapons can be carried intact, while heavier ones may need to be broken down into several components for transport - typically carried in specialized rucksacks or carrying rigs once broken down. Such weapons typically break down into three components - the gun itself, the tripod to mount it on, and the ammo. A crew-served team consists of however many people are necessary to move the weapon and ammo or other components around the battlefield. One member of the team acts as the gunner (and carries the gun itself), another acts as the assistant gunner (carrying the tripod and/or ammo), while a third and potentially fourth and fifth haul around additional ammo and act as security for the gun team. Crew-served weapons are extremely powerful and can be effective in both the defense and offense when employed correctly. The following guidelines should help to ensure that these powerful weapons are in fact employed correctly. A crew-served weapon team typically consists of a gunner, assistant, and one or more ammo bearers. The exact responsibilities will differ based on the type of weapon it is, but their general responsibilities are as follows. Adapt the relevant guidelines for other teams (ie: medium machinegun, medium or heavy anti-tank, mortars, etc) where appropriate. Carries the main part of the CSW. Chooses where to employ the CSW and directs the a-gunner to deploy the tripod accordingly. Responsible for relocating the CSW as required, in coordination with higher leadership. Engages targets and listens to his a-gunner's directions. Second in command of the team. Carries the tripod for the CSW (if applicable) as well as some additional ammo. Equipped with binoculars, he acts as a spotter for the gunner. Ensures that the CSW is loaded and that ammo is available for reloading. Provides security for the gunner/a-gunner when not actively loading the CSW. Stick together. A heavy weapon without a tripod to put it on is functionally worthless. The gunner & assistant gunner (who carry the weapon & tripod) should stick close together, with the ammo bearer(s) tagging along behind them. Know how to deploy/undeploy rapidly. 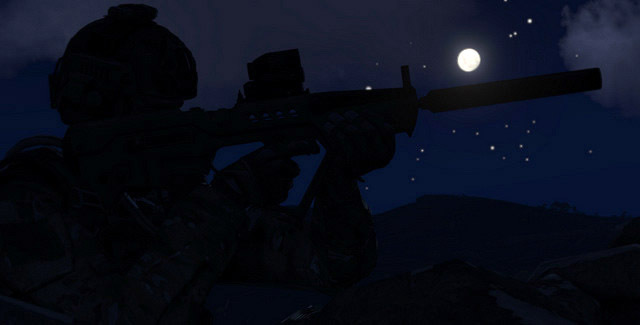 The crew-served team is most vulnerable while emplacing the weapon or breaking it down. They may have to deploy or displace under fire or on short notice, so it is imperative that the crew be familiar with the process. The gunner removes the gun from the tripod, the assistant gunner takes the tripod, and the ammo bearers act according to the situation. Ammo bearers either provide cover fire for the gunner/a-gunner (if in contact or under fire) or pick up any spare ammunition at the site of the gun (if the situation allows for it - do not grab the ammo if it means you're going to get shot doing so). 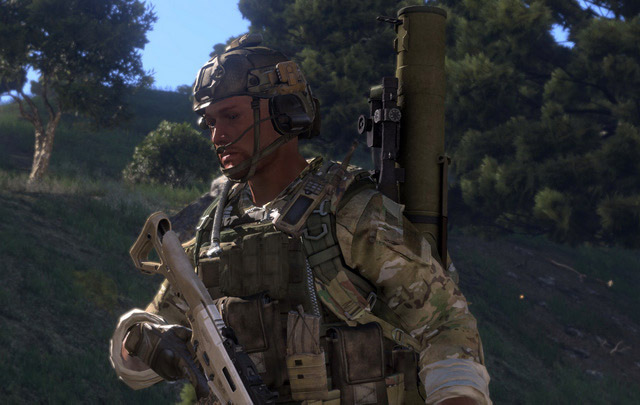 The team leader decides on where to emplace the gun, and he coordinates with higher leadership (such as the Weapons Squad Leader or the SL of the squad he's attached to) to get his crew-served teams set up where they can best support the platoon. He should pick spots from which the weapon can have a good influence on the battlefield without being too exposed to the enemy. 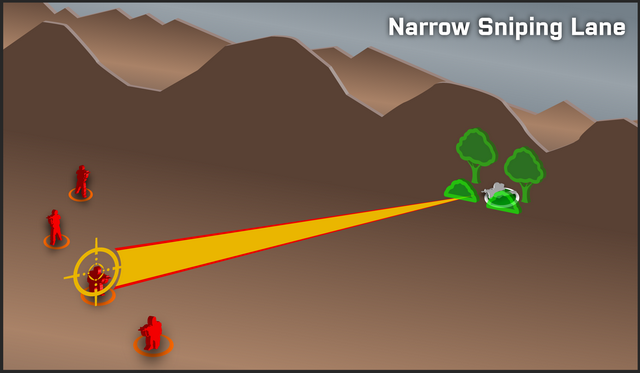 Positioning on a prominent, visible terrain feature tends to get crew-served teams wiped out. When deployed, the ammo bearers act as security for the crew-served weapon. They should "ground" (drop) some ammo for the two-man gunner/assistant gunner team, then move to positions from which they can protect their gun team. Tripod-based TOW missile system. 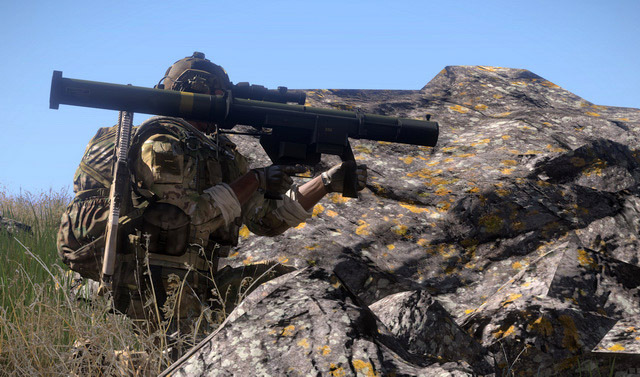 The main advantage of the TOW missile over the Javelin is that it has approximately two times the range of a Javelin - almost 4 kilometers. This is brought into Arma 3 by the All in Arma mod. An anti-air missile team consists of a gunner and assistant gunner. Equipped with a man-portable AA missile system such as the Titan MPRL, and an additional missile, the two must be ready to use their launcher to engage and destroy any enemy air threats that might appear over the battlefield, either fixed-wing (jet) or rotary-winged (helo). Their proficiency and situational awareness can be the difference between life and death for a squad or platoon. Fire high-probability shots only. Try to hit the aircraft when it is flying away, or flying at a shallow oblique angle relative to you. The closer they are (to a reasonable degree), the more likely the missile will be able to hit them before their flare countermeasures can be effective. Seek positions that give good visibility over large areas of terrain, with clear lines of fire into the sky. 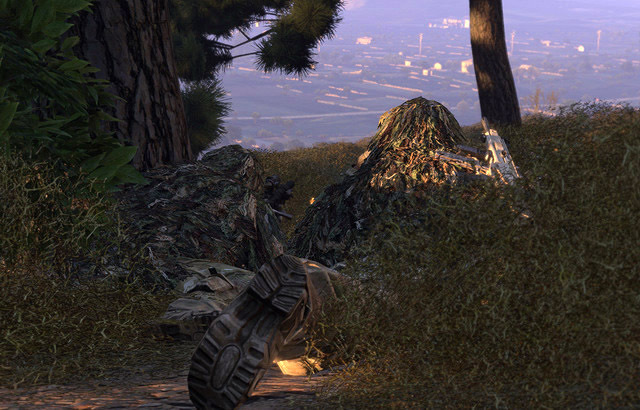 An anti-air team sitting at the bottom of a valley is far less effective than one positioned in a concealed ridgeline location. Likewise, a missile team hidden in thick forest isn't in a position to do much should the enemy appear suddenly. Avoid shots against a jet aircraft that is flying perpendicular to you. You will usually be better off waiting for a rear shot when firing on jets. Close-range flank shots against fast-moving helicopters can also be risky, but generally helos are flying at a speed that allows almost any aspect shot to work on them with equal effectiveness. Be aware of friendly positions. Shooting down an aircraft and having it land on top of a nearby friendly squad is less than desirable. The machinegun rules the realm of infantry. The ability to place sustained accurate fire in high volume on the enemy is capable of inflicting a large number of casualties in short order when properly employed. Medium machineguns typically fire a 7.62x51mm caliber bullet or larger - significantly more powerful than the infantry's normal rounds. An MMG has a longer range than an automatic rifle, and by default are loaded to fire daylight-visible tracer ammunition every fifth round. When employed in a base-of-fire or support-by-fire position, or when employed in the defense, MMGs are a powerful asset to any unit. The MMG team consists of three people - a gunner, assistant gunner, and ammo man. In some situations the team will be reduced to a gunner and a-gunner, in which case the a-gunner gets the responsibilities of the ammo man as well as his own typical responsibilities. Their responsibilities are as follows. The MMG Team uses the same guidelines as the basic fireteam members, with the Gunner using the guidelines for the Automatic Rifleman, the Assistant Gunner using the guidelines for the Assistant Automatic Rifleman, and the Ammo Man also using the Assistant's guidelines. A heavy machinegun (HMG) is a crew-served weapon, using the same guidance outlined above regarding CSWs. 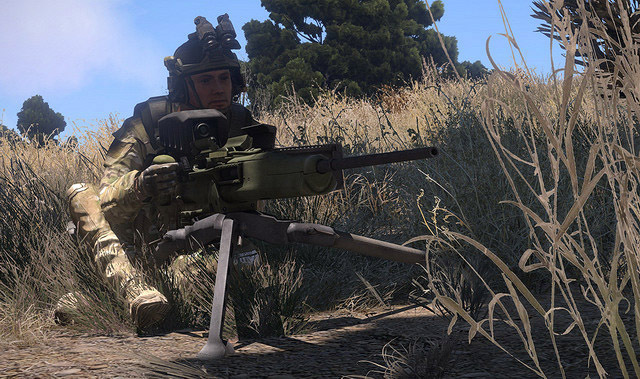 Heavy machineguns give infantry a tremendous range and a powerful punch - the Mk30, for instance, is a .50cal machinegun that is capable of defeating light armored vehicles as well as punching through heavy cover. HMG teams look for locations from which the superior range of their weapon allows them to damage the enemy with a lesser risk of effective return fire. These teams carefully evaluate the terrain and enemy situation in order to maximize their concealment until the enemy has committed fully into their kill zones, only then opening fire in order to maximize shock and casualties. The most lethal heavy machinegun on the battlefield is the grenade machinegun - such as the Mk32 or Mk19. These launchers fire 20 or 40mm grenades out to a distance of over two kilometers and are devastating when employed against any enemy element up to and including light armor. Whatever weapon an HMG team might have, it's important for their crews to remember that their extreme lethality makes them a high-priority target for any special assets. HMG teams must continually assess their position and vulnerability, relocating to alternate positions in order to foil enemy attempts to destroy them. 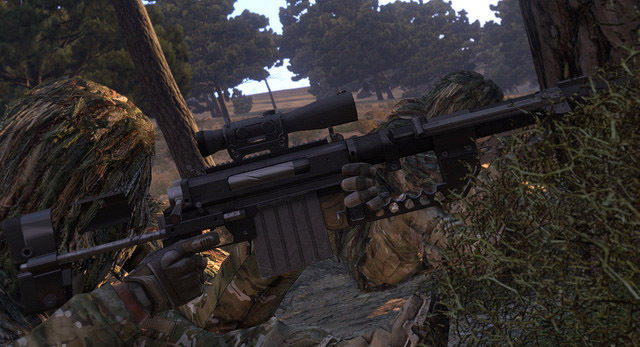 Arma 3's crew-served HMGs tend to have magnified optics with thermal and nightvision capabilities, as well as laser rangefinding abilities - all of which serve to make them one of the most feared weapons to encounter on the battlefield for infantry. Mortars are a specific type of artillery support that is organic to infantry units due to its ability to be man-carried along with the grunts. Mortars provide integrated indirect fire support to the infantry, with quick response times, the ability to bring fire safely to within close range of friendly forces, good accuracy and range, and solid terminal effects. The mortar is often called the 'hip pocket artillery of the infantry'. The 60mm mortar is the most man-portable of those available to NATO forces. It can safely be used to drop rounds close to friendly forces (when in the defense, the 60mm can hit targets as close as 70-100 meters away from the gun position). The 60mm mortar is capable of striking almost anything within three and a half kilometers of it. This allows for the mortar team to be well out of enemy direct fire while still supporting an attack via fire. The typical time-of-flight for a mortar round is from 20-40 seconds, so that must be accounted for when planning fires. 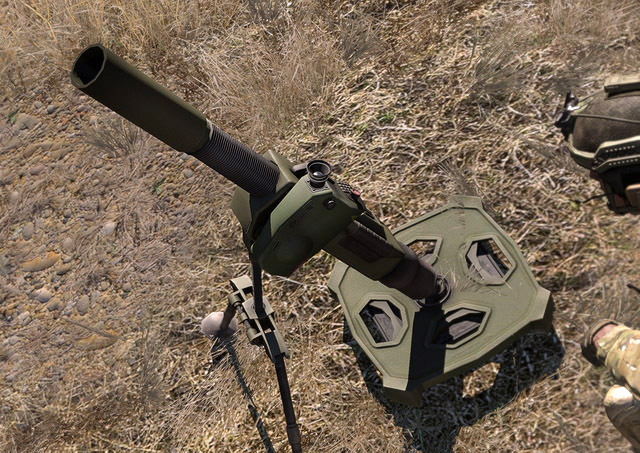 We'll talk primarily about the 60mm mortar, as it's the most commonly used mortar for infantry operations. The guidelines, procedures, and responsibilities for an 82mm squad are the same as for a 60mm team. A variety of ammunition and fuze types give the 60mm mortar a range of possible applications. High explosive (HE). Simple explosives that kill via blast and fragmentation effect. White Phosphorous (WP) or smoke. Used for smoke concealment, marking, or to cause incendiary effects. Illumination (ILLUM). Parachute flares used to provide illumination in low-light/night conditions. Laser-Guided. A laser-guided mortar round allows extreme precision to be achieved, though they require someone to be in a position to lase the target - not always an easy thing to ask for. Proximity (PRX). Causes the round to burst from 1-4 meters above ground. Near-surface Burst (NSB). Causes the round to burst about a meter above the ground. Impact (IMP). Causes the round to burst upon impact with the ground. Delay (DLY). Allows the round to penetrate into the ground somewhat before exploding. Both mortars and larger artillery pieces share a common system for employment, known simply as the Artillery Computer. This device is used to target the mortar, select round types, and also choose the charge weight (mode) to use when firing. Charge weight is simply the amount of propellant used to fire the shell. More propellant means that a round will fly further and take longer to hit a given area. As you change this, the range indicator will react accordingly - the minimum range will increase, same with the maximum. Note that different charge weights have some overlap with each other - a 'low' charge and a 'medium' charge will be able to hit some of the same areas, with the difference being that the 'medium' charge round will have flown higher and thus will take a bit longer to impact the target. 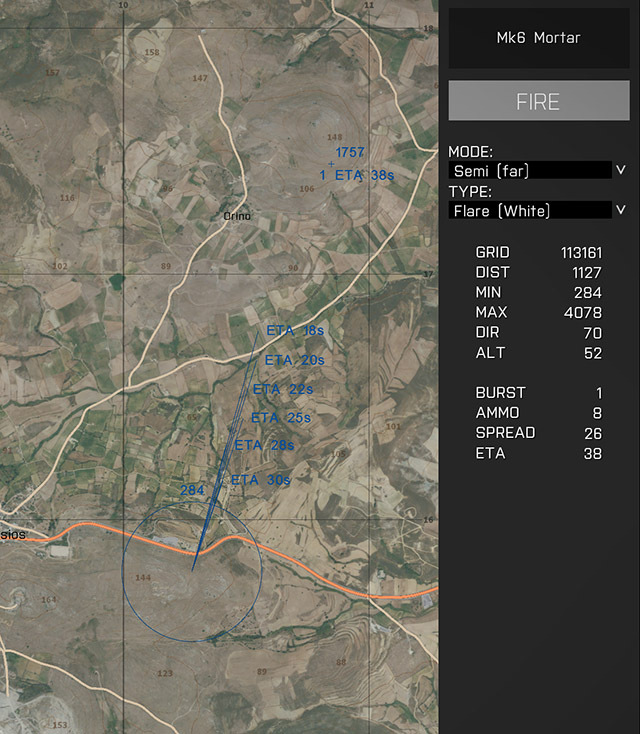 The interface shows a breakdown of all relevant information, to include the grid, direction, altitude, and distance of your mouse cursor on the map, the minimum and maximum ranges of the given fire mode, how many rounds of ammo remain for the selected ammo type, the anticipated flight time, number of rounds to be fired per shot, and the expected spread of the rounds. The arty operator clicks on the map to designate where he wants the round to impact. If within the current charge weight's capabilities, an estimated time-to-impact will display. If not, the operator must select a higher charge weight. When capable of firing, the 'Fire' button will become selectable. Clicking on this will fire the currently loaded round at the currently designated target. When a round is fired, the computer will trace a line indicating the round's flight, with an estimated flight time remaining. Multiple rounds will each have their own trace. The flight time can be conveyed to those being supported, such that they know how long it will be before the rounds impact. When the first round is five seconds from landing, the mortar team calls "Splash" over the radio, warning the supported troops that the first round is five seconds from impact. 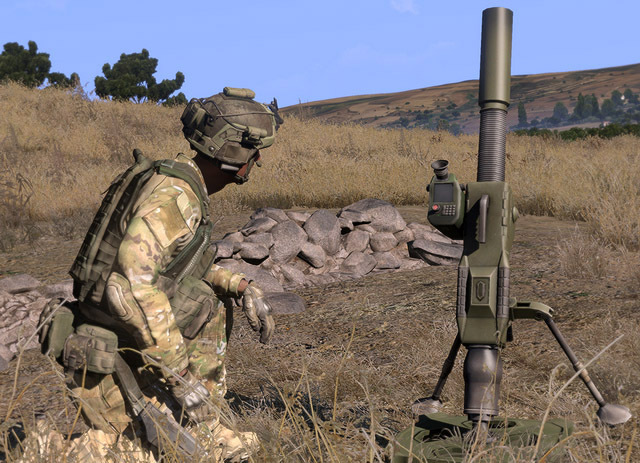 The mortar's optics can also be used to direct fire when in visual range of the target. Entering the mortar sight mode will display the direct-fire interface. 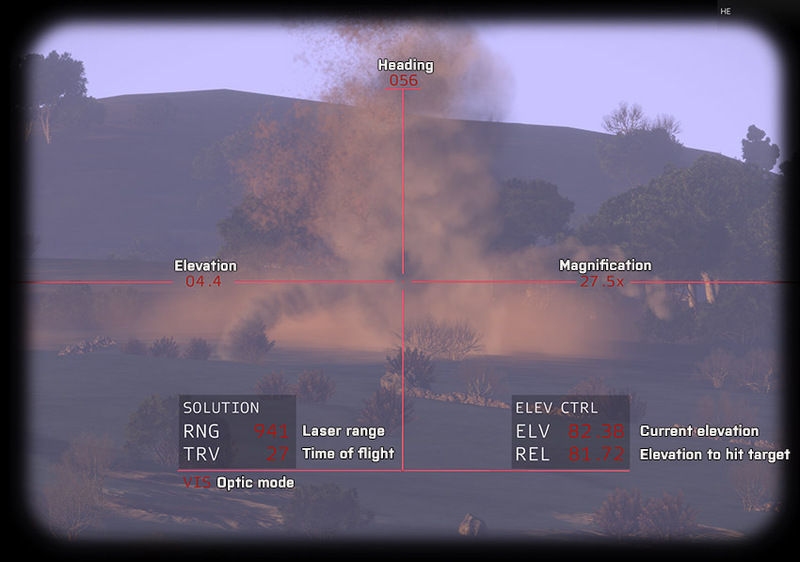 In this mode, a laser rangefinder detects the distance to the center of the crosshair, then displays a firing solution that can be used to dial in the mortar's aim. Each 60mm mortar squad consists of three players - a gunner, assistant gunner, and ammo man. Depending on the situation, they may or may not have a vehicle transporting additional ammunition for them. When used in the defense, they typically have crates of mortar shells available for their usage. The responsibilities of the squad members are as follows. Chooses the emplacement position of the mortar. Coordinates with higher HQ regarding employment of the mortar. Carries the mortar baseplate and tripod assembly. 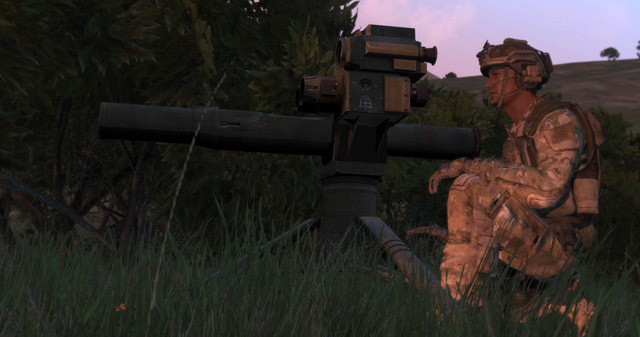 Equipped with binoculars, he acts as a spotter for the gunner when firing on targets within visual range of the mortar. Drives the mortar squad vehicle, if assigned. Carries additional ammo for the mortar. Provides security for the team. Guns for the mortar squad vehicle, if assigned and applicable. A few basic guidelines for mortar teams follow. Mortar teams need to take initiative even more than most other players. They should set up their mortars without having to specifically be told to, in keeping with the overall commander's intent. The mortar position should be protected from direct-fire weapons as best as possible. This means situating in the courtyard of a large building, behind a hill, in a depression, or some other place where the natural terrain protects the team from observation or fire. Plot out targets in advance. Locate likely attack, rally, or observation points for the enemy and ensure that you know the numbers needed to get rounds on those locations quickly. Only use mortars against targets that can potentially be hurt by them. Don't waste rounds on tanks, but instead concentrate on soft vehicles and infantry. Use the right round if you have multiple types. Mix them to get a more pronounced effect - for example, a mix of white phosphorous and high-explosive rounds can be quite deadly. The mortar ammo bearer(s) should provide security to the gun team. This means that they need to be positioned in areas where they can see any potential enemies approaching from any direction, and can warn the gun team in time. If the mortar team must withdraw and cannot take the entire gun with them due to casualties, someone needs to grab the mortar tube itself and carry that away. This is as close as we can get to "spiking" and destroying the mortar to prevent it from falling into enemy hands. The main difference between the 60 and 82mm mortars lies in their terminal effects. The 82mm mortar fires a significantly more powerful shell, causing greater damage upon detonation. The 82mm mortar is also significantly heavier than the 60mm mortar and requires more effort to transport around the battlefield. They will often end up carried in MRAPs and other vehicles, with minimal 'foot marching' occurring. This is in contrast to the 60mm mortar, which can fairly easily be man-transported over the battlefield. Other than these differences, the mortar squad and 60mm mortar team are virtually identical. 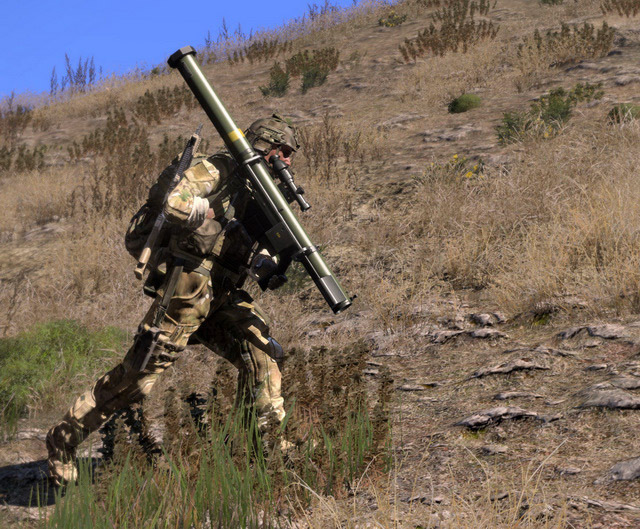 The 82mm Mortar Squad uses the 60mm mortar and Crew-Served Weapon guidance as their baseline. 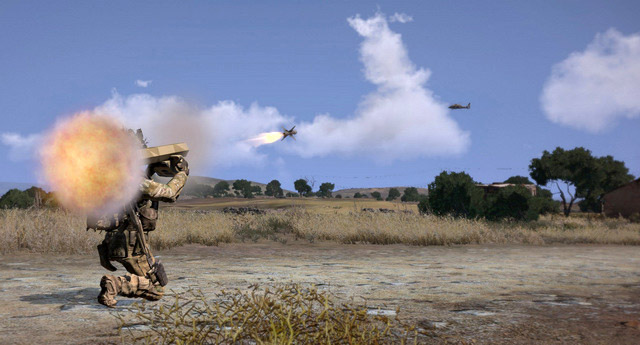 A medium anti-tank (MAT) team is a rocket team that is capable of delivering accurate and deadly direct-fire against tanks, bunkers, buildings, and other suitable hard targets. They are commonly attached to a platoon when assaulting fortified positions or when enemy armored assets are expected. Two example MAT weapons are the SMAW and MAAWS launchers. Crew-served. A MAT launcher is used by at least two players. One is the gunner, the other an assistant gunner that carries additional rockets and assists the gunner in the employment of the weapon. Additional ammo bearers may be assigned as the situation requires. Reloadable. Unlike the basic light anti-tank launcher, a MAT launcher is reloadable. The gunner himself typically carries two rounds, with the assistant gunner having two or three more, giving them four to five rockets to use before needing resupply. Scoped. Most MAT weapons you will use will have a magnified optic, allowing for better target discrimination and more precise aiming and post-shot damage assessment. Multiple round types for a variety of roles. 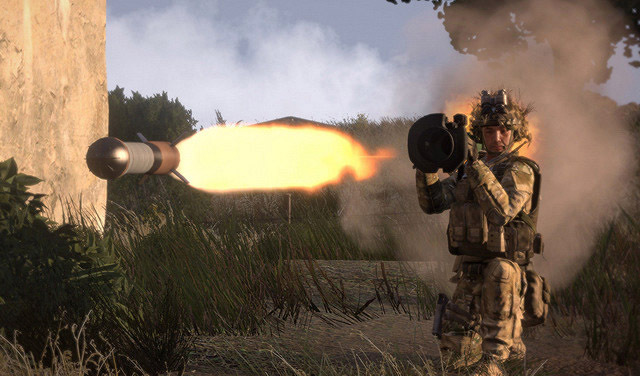 MAT weapons carry a range of rocket types that each have a specific use, allowing a MAT team to pick the best rocket type for the task at hand. HEDP - High-Explosive Dual-Purpose. HEDP rounds are effective against light armor, walls, structures, bunkers, etc. They do a significant amount of area damage, and a fair amount of anti-armor damage. HEAA - High-Explosive Anti-Armor. HEAA rounds are ideal against medium and heavy armor. They do very little area damage, but a great deal of anti-armor damage. FTG - Follow-Through Grenade. The FTG rocket blows a hole in a wall and then projects and explodes an additional charge (the 'grenade') on the far side, causing additional casualties. NE - Novel Explosive. Novel Explosives use thermobaric principles to cause extreme blast and pressure damage around their point of detonation. These are very effective against infantry and buildings. Each MAT team consists of two people - a gunner and assistant gunner. Chooses the firing position for the team. Decides on the best rocket type to use on the given target. 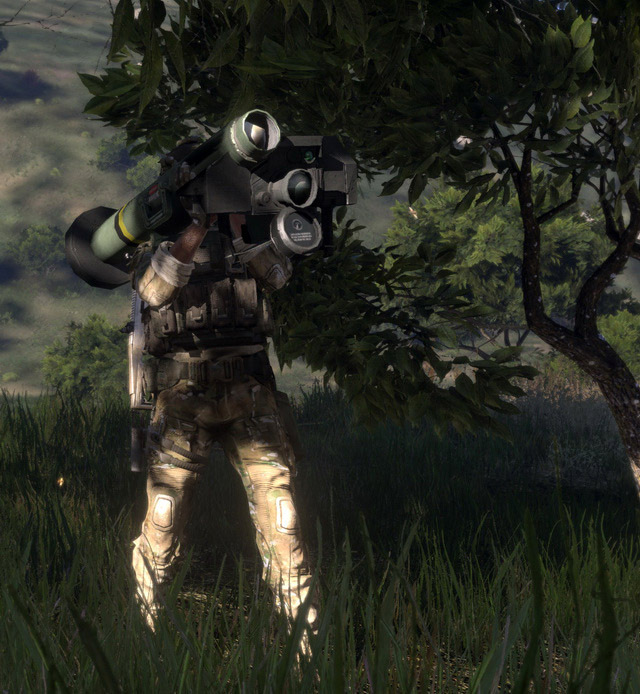 Equipped with binoculars, he carries additional rockets for the launcher and acts as a spotter for the gunner. Gives adjustments to the gunner's spotting rifle and rocket fire, scans for, and prioritizes enemy armored targets and emplacements. Provides rockets to the gunner when required. Know your rocket types. HEDP rounds do a lot of damage to infantry in a decent blast radius, as well as cause damage to structures, soft vehicles, and light armor. HEAA, by comparison, does much less 'splash' damage but does do a great deal of damage to armored vehicles. When not fighting armor, the launcher's optic can be used to assist the infantry in spotting concealed or distant targets. Reload in cover. Fire from different positions each time, as the situation permits. Backblast will give you away most of the time, so ensure that you move away from it after each shot. The heavy anti-tank team (HAT) wields the most deadly anti-tank infantry-carried weapon systems available. When heavy armor is expected, they are great assets to have attached to the platoon. 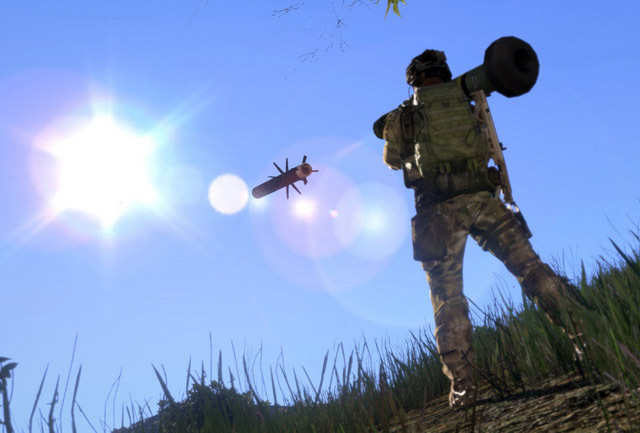 HAT in Arma 3 comes most typically in the form of the Titan launcher or PCML, with Javelin missiles appearing in various modern mods. Fire-and-forget or manually-guided missiles. If fire-and-forget, once the missile has been launched, the team can immediately take cover. Most fire-and-forget launchers are capable of being carried by one or two people, and once assembled, employed and carried by a single gunner. Heavier tripod-mounted launchers usually require a gunner to track the target from launch until impact. These larger, tripod-mounted launchers tend to make up for this requirement by having exceptionally dangerous terminal effects. Extremely deadly warheads. HAT missiles generally use advanced armor penetration techniques such as explosively formed projectiles or dual-warhead designs that can not only punch through enemy armor, but also defeat defensive technology like reactive armor. HAT missiles are superb at killing enemy tanks. Long range. HAT missiles have ranges exceeding one kilometer, often reaching out to two kilometers and even further for larger weapons. MAT, by comparison, tends to have a range of 600 meters or less, while LAT is often restrained to 300 meters for maximum effectiveness. Magnified optic. Like the MAT launchers, HAT launchers sport high-magnification optics. Unlike MAT launchers, many HAT launchers have further capabilities - such as nightvision and thermal optics. These enhanced capabilities make them usable in more demanding weather and visibility environments, as well as make them superb for target identification and post-launch battle damage assessment. Reloadable. HAT systems are usually reloadable, allowing them to fire as many missiles as can be carried into battle by their teams. Each HAT team consists of two people - a gunner and assistant gunner. Additional team members may be required for heavier, tripod-based launchers, or to carry extra ammunition. Picks the position from which the missile system will be employed. Exercises good judgment insofar as "What rates being destroyed by my weapon? ", and preserves his round(s) when other anti-tank assets are available to deal with lesser armor. Equipped with binoculars, he carries an additional missile and acts as a spotter for the gunner. Scans for, identifies, and prioritizes enemy armored targets. Provides an additional missile to the gunner when one has been expended. Do not waste your missiles on light armored targets. LAT and MAT teams can deal with light armor just fine - save the HAT missiles for enemy main battle tanks or other high-priority threats. When not fighting armor, the launcher's magnified optic can be used to assist the infantry in spotting concealed or distant targets. Reload in cover. Fire from different positions each time, as the situation permits. Due to the soft launch nature of the missile, your backblast will be hard for the enemy to locate.